Today's feature is from The Healthy Beehive ... Jane's Coconut Banana Bread is made without dairy, eggs, or gluten, and it looks great! Bananas and coconut always make me think of tropical islands .... I can totally see this bread with some funky pineapple jam. Click on the title above Jane's photo to jump to her site and see all the recipe details. Hi! This week I've shared my Nut Roast recipe! We have enjoyed eating this for years! It is dairy free, egg-free, grain-free and gluten-free. Thank you for hosting and have a lovely week! Thanks for hosting! Always love the recipes here. 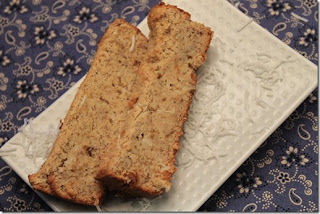 That coconut banana bread looks amazing! This week I am sharing SCD friendly roasted red pepper lentil hummus. Super delish. Have a great weekend friend. Good morning! I posted Easy Granola Bars, which turn out crunchy. The second is Fool Ranch Dressing, a yogurt-based dressing for salads and dipping. I had a hard time finding one at the store without MSG and was horrified by some of the other ingredients. This is such a great link-up idea. Thank you for hosting! Happy Friday! I shared my recipe for a No-Bake Key Lime Pie that takes under 10 minutes to make. Have a wonderful weekend! Hi Lisa - I just added my recipe for Quinoa-Potato Cakes Florentine with Mustard-Yogurt Sauce. The cool think about them is they use pumpkin seed meal instead of wheat-based breadcrumbs. Thanks so much for hosting this site - it's such a great idea! !